Any guitarist worth their salt will tell you that playing the guitar is one of the most aurally rewarding pastimes available. Those same guitarists will also tell you that adding effects to your play can be a way to enrich your own personal style and sound. Many amplifiers can provide a variety of tones through a dedicated FX or effects knob, but with these types, you don’t always get the range that you want. If you are looking to create a different sound, then maybe you should try utilizing a multi-effect pedal. These types of pedals give you a robust selection of sound and are really easy to incorporate into your playing. We’ve taken the time and have selected some of the best multi-effects pedals that are on the market today as well as a great budget model that won’t set you back by a whole lot. Simply put, there are few brand names that are more iconic in the world of guitar effects pedals than Japan-based Boss Musical Instruments. Beginning in the 1970s, Boss has become well known for a myriad of well-received musical products. One of their most famous guitar-boosting devices was the ME5 multi-effects pedal that they released in 1985. 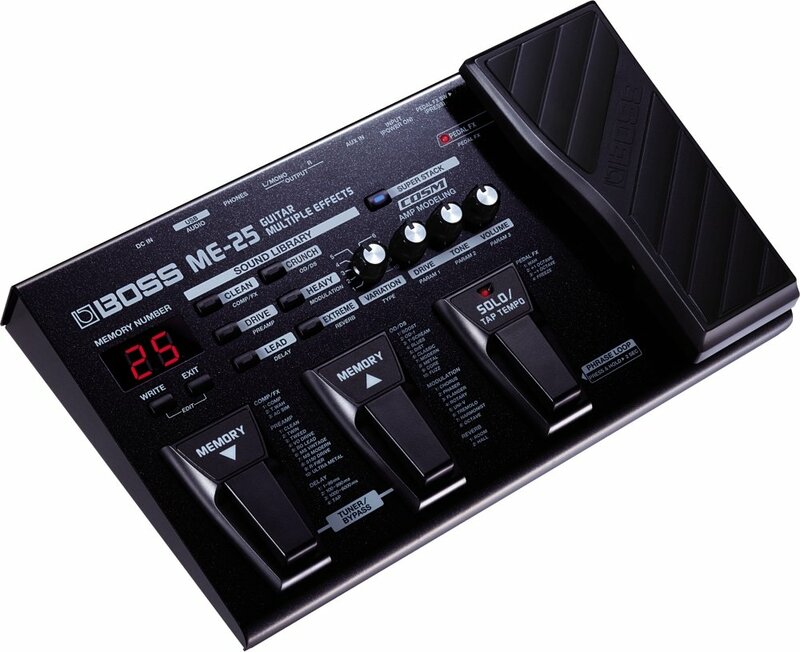 The ME5 was the first programmable multi-effects pedal and Boss has progresses this history of creating innovative products by releasing the latest iteration of the M series, the M25. To start, this is a complex looking device that Boss clearly designed to be feature-rich and sturdy. The first things that you might notice are the three nearly identical pedals that are positioned on the top of the multi-effects pedal’s main surface. The first pedal is labeled memory and features a down arrow, the second is similarly labeled but the arrow is facing upwards, the third and final pedal is marked solo/tap tempo. The first two pedals will help you navigate through the 60 available pre-set tones that you can establish in the tone editor. Simply save in any of the 60 slots and navigate through the numbered selections by tapping the up or down memory pedals. The third pedal is designed to operate the device’s built-in looper or gives you a lead tone whenever you need it. Above these three smaller mini-pedals is the main control section of the device. Positioned directly above the first pedal are two buttons and an LCD display. The first of the buttons displays ‘write’ and you utilize this button to save into any of the 60 available slots. The ‘exit’ button, which is positioned next to the ‘write’ button, helps you exit any of the currently selected menu sections. The LCD display simply lets you know which tone setting you have selected. • Clean – This is a Fender-friendly clean tone that’s perfect for a myriad of musical styles including surf rock, classic rock, and gospel. • Drive – This places a little dirt in your sound. With this you can create some more industrial sounds that still sound relatively smooth compared to some of the other selections. • Lead – This is the perfect effect selection for great volume with an excellent amount of fuzz. • Crunch – Another very industrial sounding effect that adds decent modulation to your guitar’s tones. • Heavy – This is where we start to really see heavy modulation; the sounds from this effect selection are very overdriven and strong. • Extreme – The highest amount of pre-set modulation. Each of these effects selections can be adjusted ten different ways via the use of the variation knob that’s positioned in the exact middle of the device. The three remaining knobs control drive, tone, and volume; each of the knobs altering the presets switches in many different ways. After you establish a sound, you can just save it to one of the 60 preset spaces. For additional effects, you can also use the third pedal to select from a range of wahs, send your tones up or down an octave, or select Boss’s proprietary freeze effect. To engage this final effect, play a note or chord, and then depress the large expression pedal and the device will extend the note. You can then play other notes on top of the ‘frozen’ note for a truly interesting sound. Finally, the M25 has scores of connectivity functions. Outside of the guitar input, you’ll find several options along the back of the unit. First, there is an AUX connector that allows you to input an external audio device and jam along. Secondly, there are two speaker outs, so that you can generate some good stereo sound while you play. The third connector is for a set of headphones, so that you can play in near silence, so as not to disturb the neighbors. Finally, there is a standard USB-in that will allow you to use the bundled Sonar LE software to record your music. In 1965, Vox revolutionized the world of rock by introducing the world’s first effects pedal for guitar; the Vox Cry Baby. This pedal generated some of the first wahs that have since become iconic and a major sound in the rock n roll lexicon. Since the introduction of the wah wah pedal, musicians have been demanding for even more effects, culminating in the creation of individual pedals that control reverb, flange, and delay. 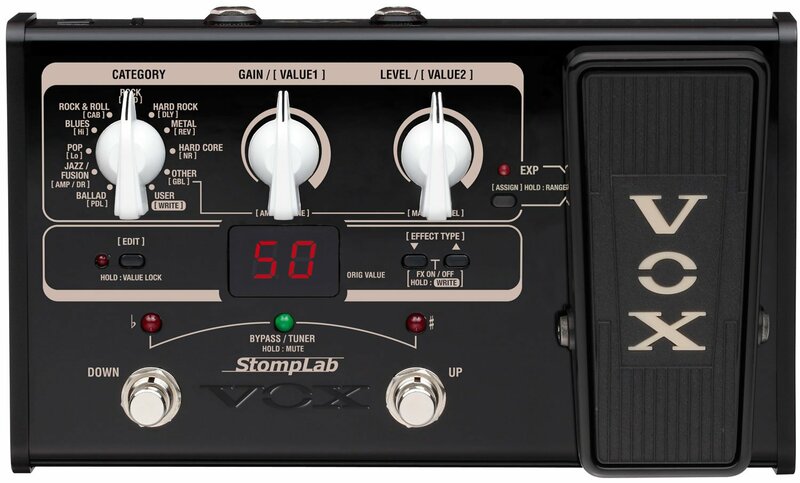 Having produced many of these effects pedals, Vox branched out and produced our Silver Pick runner up multi-effects pedal, the STOMPLAB2G. If you have an idea about the design of the Cry Baby, then the first thing that will jump out at you visually on this multi-effects pedal is the classic Vox logoed expression pedal that looks very similar to the iconic wah wah. The remainder of this multi-effects processor is dedicated to the production of the effects that you can modulate via the expression pedal. In terms of structure, this is a very durable pedal; the entire body is made of a strong metal that is designed to survive life on the road. It’s painted black and has beige highlights surrounding the numerous features. On the face of the device, you’ll find the main selection of effects settings. Along the bottom are two metal foot switches that make navigating through the numerous tones an easy task; the left switch navigates down and the right navigates up. Directly above these switches are buttons that help you navigate through the effect types and lock in the value of tone that you’ve selected. As you can tell, the majority of these are genres of music and the tones that these category settings produce are indicative of some of the more iconic sounds that come from these types of music. The other selection is a preset that you can manipulate directly using the two other large dials; gain [value 1] and level [value 2]. With this selection you can generate some nice sounding tones. The final User selection is completely programmed by you and can be saved into 20 available slots. Taking everything into account, the Stomplab effects pedal can provide 103 typed of modeling effects for your music. Insofar as connectivity, you won’t be able to connect this multi-effects pedal to your computer, but Vox does provide connections for headphones or speakers dependent on what kind of sound profile you need to play under. 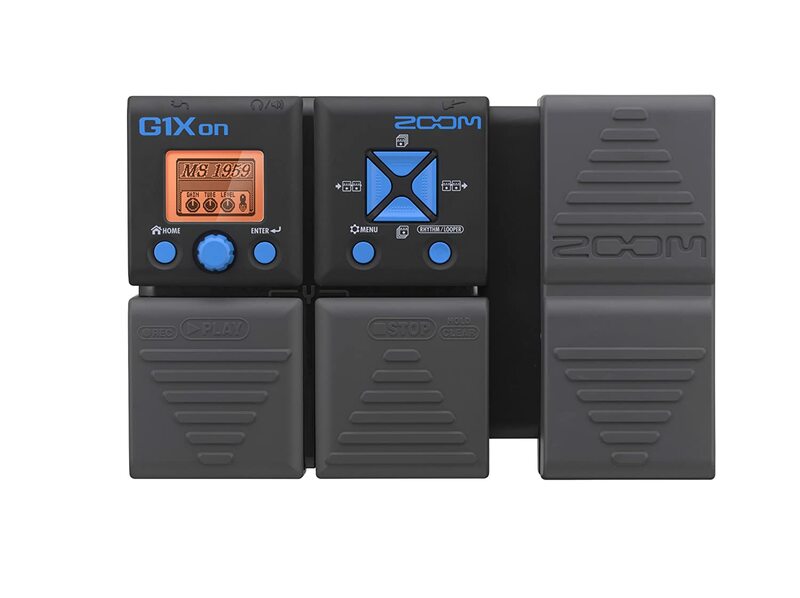 Our Bronze Pick multi-effects pedal is produced by Zoom, a popular instrument brand that is based in Japan. They have several lines of musical devices that span from drum machines to an extensive line of guitar pedals and recording devices. Zoom has been producing quality devices like these for over thirty years and their multi-effects pedal is a quality tool for your music that will not only give you the effects that you crave, but will also not cost you a whole lot. The first thing that you might notice when comparing our Bronze Pick with our other selections is that this multi-effects pedal doesn’t have the same type of construction. Whereas the other pedals are made of metal, the Zoom pedal is primarily comprised of plastic and rubber. While you might think that this will make this a less portable unit, you would be surprised at how durable this small effects pedal actually is. The pedal features three different pedals. Two of the pedals carry out the navigational and playback functionality that is needed for some of the functioning of this device. These first two pedals, positioned along the left and middle positions respectively, have a textured down arrow on the leftmost pedal and a textured up arrow on the middle pedal. You can use each arrow to cycle through presets, press them together to access the built-in tuner, or you can utilize the left pedal to record your loops, and the right pedal to stop recording. Amazingly, this pedal can generate some great sounding wahs and reverbs; you can modulate the sound of these effects by the use of the rightmost expression pedal. While this model of multi-effects pedal may seem like it has less of an interface than the other picks on our list, the actual amount of selections is fairly impressive. The pedal features 75 built-in effects, features 14 amp model effects, and you can save up to 100 different user modified tones into the pedal’s internal memory. On top of these robust features, you can even utilize five effects simultaneously with this device. Most of the onboard features are accessed via the switches above the pedals and the onboard LCD screen. As mentioned before, you can navigate the menus using the two pedals, but in addition to this there is a directional pad and a dial to set up all of your presets. Insofar as connections, this pedal has a reasonable amount of them. If you want to jam along with your favorite tunes, then you can utilize the AUX connector. If you need to play in quiet, there is also a jack for a set of trusty headphones. If you have computer software that you’d like to record your music with, there is also a USB port designed specifically with this in mind. All of these jacks and connectors are located on the back of the unit; and in addition to these, you’ll find the standard DC connector, as well as an input for your guitar. What happens if you want to create a bevy of unique-sounding guitar effects but are ballin’ on a budget? 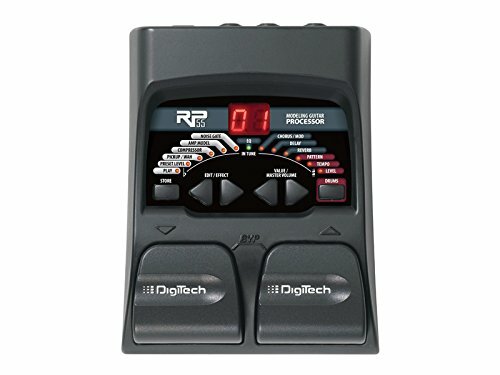 Luckily, Digitech, a company that has specialized in creating unique guitar effects since 1989, has designed their RP55; a versatile effects-packed device that simply will not disappoint. At first glance, you’ll certainly notice that this device is more of a multi-effects processor than a pedal. Unlike the other devices on this list, this one doesn’t employ an expression pedal to control and modulate effects like reverb, whammy, or wahs. This lack of a dedicated expression pedal does not make this device a lower quality item; it has more than enough features to make up for a lack of this style of pedal. Along the bottom of the front casing it does have two footswitch style pedals that you can operate with your feet, though these are also easily operated with your hands between sets. Like the other devices on this list, these two pedals can be used to control and select from the 20 studio quality sound effects that this device can create. Near the top of the device is a listing of the available effects that you can edit and alter to your specifications. This list includes; pickup/wah, compressor, amp model (of which there are 11 pre-programmed amp types), noise gate, chorus/mod, delay, reverb, pattern, tempo, and level. The machine also has drum emulation, which will give you a beat to play to. As one might expect, the actual level of available effects that can be generated by a single multi-effects pedal can greatly vary based on model. Whether you get a more modest set of effects; somewhere in the range of 20 to 30 effects or a multi-effects pedal that boasts over a hundred effects typically comes down to how much money you are willing to spend. When looking for a brand new multi-effects pedal, first consider what you are buying the device for and whether you need a plethora of obscure effects to complete your sound, and then consider how much you’re willing to spend to get a more varied choice when it comes to effects. Even with so many effects to choose from, some multi-effects pedals give you the opportunity to create your own sounds and even store some of the music that you make on-board the device itself. When you are looking to purchase one of these tools, find out if the models that you are looking at feature an on-board memory; a few hundred megabytes are typically useful in this regard. Then, decide whether you will be recording music onto the devices or will be creating presets and kits that you will want to store later. While you might just be seeking a specific pre-set sound, it certainly couldn’t hurt to have an option to save some of your own creations as well. These types of devices can have a bevy of different connections that span the gamut of MIDI connectors to headphone jacks. Connector types really vary from device to device and as a general rule; you might want to seek out multi-effects pedals that incorporate at least some level of headphone and computer interface. Having a headphone jack will enable you to play your guitar with effects during times and circumstances where loud noises are inadvisable. Computer connectivity will allow you to download tones and effects on some models and allow you to sometimes upload music to the cloud or to your local machine. Without question, multi-effects pedals are designed for one thing: producing unique effects for your guitar. At the same time, it doesn’t hurt if there are a few extra features that expand on the already massive versatility of these items. Some additional effects are included in some of the items we’ve reviewed in our article; a perfect example of this type of extra feature is the drum machine included with our budget choice. Some of these types of devices incorporate features like built-in metronomes or even a tuner for your guitar. When seeking one of these devices, you’re obviously in for the effects, just try to be sure to take into account any extra bells and whistles that the manufacturer may provide as well. You may also try with a flanger pedal, it has also very good features. To execute effects like whammy bar emulation, expression pedals are incredibly useful. These are the large pedals that come with these types of processors that allow you to modulate the frequency of the effect. Not all multi-effects processors come with an expression pedal; an example of one is our budget pick. For these types, you can usually attach an external expression pedal if you want to modulate the effect with your foot. If you want to emulate some of the sounds produced in rock n roll’s heyday, there is no easier, user-friendly way to do this than by utilizing a multi-effects pedal or processor. When seeking out a device on your own, please check out some of the items on our list and take a look at some of our pre-purchase considerations and you’ll be well prepared to start making some great sounding, iconic music of your own.